But not the Eagles. I hope the Vikings f*ck the Eagles up. I remember thinking this exact thing watching Malcom Smith TAINT Peyton. Specifically, "What is HAPPENING?!? We're the Seahawks!!! We don't do 80's-style blowouts in the Super Bowl!!!" I love watching other long-downtrodden fan bases getting to experience the same thing. It's great. 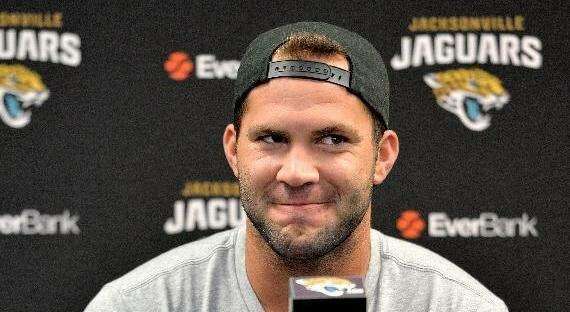 Apparently Mularkey's extension was measured in hours. He's out in Tennessee. #Titans GM Jon Robinson and CEO Steve Underwood told coach Mike Mularkey before the game and told him they were extended him and he was their guy. They said they'd get it done after the game. Now this. Aight, so they offer him an extension and then fire him as he didn't cop to their OC plans. I can get behind this. Mularkey in Cleveland is too perfect. I read several places claim as well as on the NFL network this morning that the Vikings play was the first walk off TD to win a game.. I'm fairly sure Franco Harris also scored with no time left to win that playoff game as well no? And I thought Console Warz was Serious Business (tm.). Sports tribalism is pretty gross. It's the main reason I don't enjoy sports nearly as much as I did when I was a little kid and ignorant of all the bs from the fan bases. I'm obviously just as guilty of it at times. The whole thing is icky. The entire premise, all of it, of sports fandom is based upon tribalism. We wear our team's colors. We align leagues and divisions to promote rivalries. We recount the stories of past heroes and goats. Without tribalism, sports actually have no point. Sports fans embrace the facade. We know it's all BS. It's part of the fun. What is icky and unfortunate, are the sports fans that don't get this, that think they are above it, yet somehow gleefully take pride in a group of athletes' achievements, and worse, take it personal when other disparage those athletes. I'm a Cardinals fan with plenty of Cubs fans as friends (including a groomsman in my wedding), a Jayhawk fan with a ton of Mizzou fans as friends, and a Chiefs fan with several Raider fans as friends. We all rip on each other's teams, but it never crossed the line into real life, because that would be stupid. And we all avoid those fans that don't get it within our own bases. But rivalries create the excitement in the games we follow, so we all buy in. So when Guru mocks Any Reid, I may push back, but not in real life. And when he mocks Chiefs fans for the f*cking tomahawk chop crap, I just have to agree that it is lame. And he gets to hear about booing Santa Claus and batteries thrown at players. But at no time does any of that have anything to do with how we view each other outside of sports. And this community in particular is a fantastic one to be a part of, even if it's just laughing from a screen a thousand miles away. But I mean seriously Brady is the worst.. 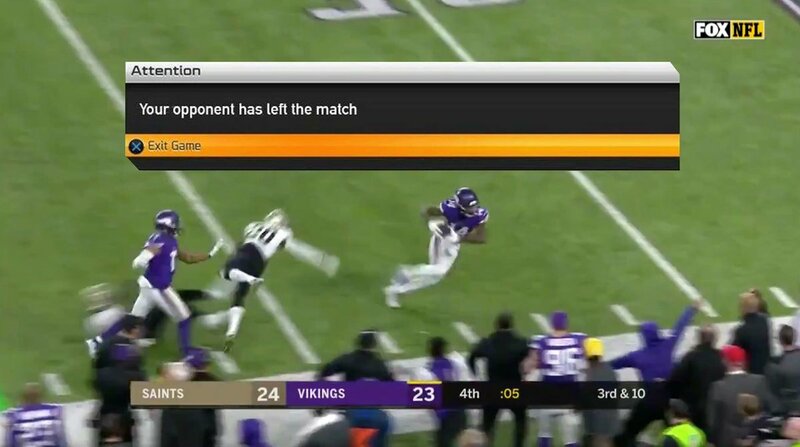 I've watched it 6 times on GamePass and its basically the modern era Immaculate Reception. My Dad's family is all still in the Minneapolis area so I got all sorts of texts from my cousins there.. I'm pretty happy for everyone there as its like you said a game that the Vikings traditionally lose. That being said lets hope a similar fate ends up for them as it did for the Steelers that playoff run. One of my favourite things about GWJ is Gamegurus' initial revulsion at the Mannings slowly morph over time into revulsion for Brady. Looks like they kicked an extra point after Franco Harris' Immaculate Reception. Either rules changed and we no longer need to kick the extra point or there was time left on the clock on the play (which I doubt seeing as there was only 22 seconds on the clock). Edit: Nevermind, the Vikes kicked an extra point too. Now I'm lost. The official broadcast displays FINAL after Franco scores the TD. As well last night they certainly lined up to kick the extra point.. they just decided to kneel which still means it was the same as the Steelers. Oh wait.. I listened to the audio and the announcers says 5 seconds to go after Franco scores.. so there it is thats the difference. When Tenn. beat Buffalo there was 3 seconds left in that game. He's a BEAST! The man willed that score into existence. I've honestly enjoyed just watching this season casually and not trying to care too much - a very good choice given my team didn't make the playoffs. My main reason for rooting against the Patriots this year is I would love to see an underdog team make it to the Super Bowl. Jacksonville versus either Minn or Philly would be an entertaining game at least. I'm enjoying the crazy down-to-the-wire playoff games and hope the Big Game is equally close. Nope, the game was not over. After Gerela's PAT and a kickoff, Oakland had time for one play. The Steelers defense was mentally in the locker room, so there was a scramble to get on the field. Safety Mike Wagner couldn't find his helmet. "Mike grabbed a lineman's helmet," Harris recalled, "but it was too big and he worried that it would swivel around and blind him." Stabler threw an incompletion. Game over. Pittsburgh, 13-7. I have no idea then.. seems like it has been done before. 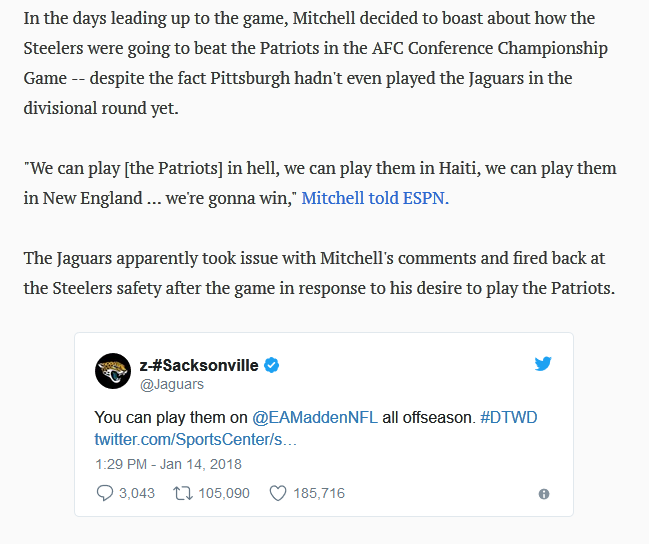 I know it's fun to rip on Mike Mitchell (briefly a Carolina Panther, btw) and the Steelers for overlooking the Jags. But everyone's overlooking some of those throws made by Roethlisberger. I know the guy is twice as old as Brady (at least he looks it), but, man, those TD passes were beautiful. That video is wrong and they misleadingly cut the audio. 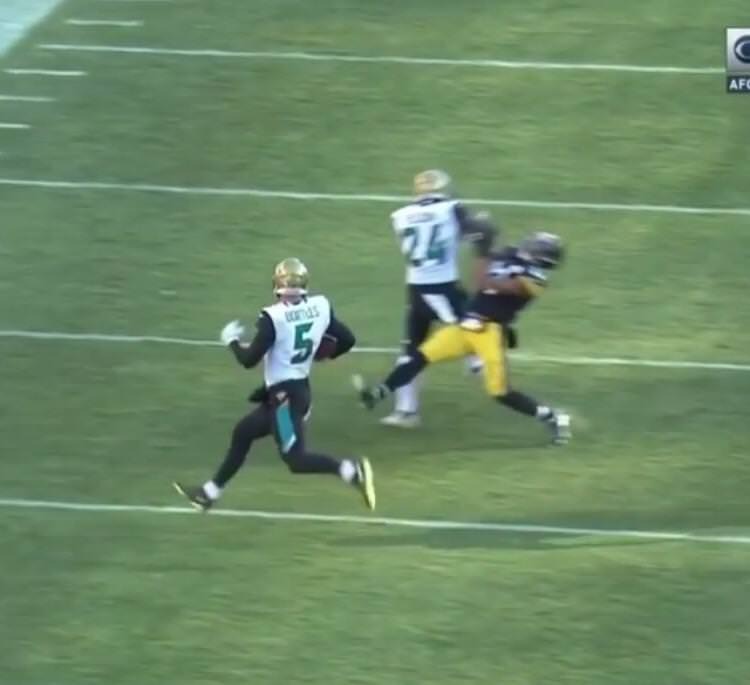 There were thirty-two seconds before the play, 24 seconds left after the play ended. What are everyone's favorite walk-off plays in football? Bonus points if you can link to the actual play/call. I'm going to go with . . . yesterday. What are everyone's favorite walk-off plays in football? The right answer: 1958 NFL Championship game. Of course you like that play, you should recognize it. From 1997, it was near walk-off, as the score came with 3 seconds on the clock. Elvis Grbac threw a 33-yard scoring pass to Andre Rison with three seconds remaining tonight as the Kansas City Chiefs rallied for a 28-27 victory over the Oakland Raiders. The Chiefs got the ball at their own 20 following a punt with 61 seconds left in the game. Grbac got the drive going with a 21-yard completion to Lake Dawson, and followed that with a 20-yard completion to Brett Perriman. With 11 seconds remaining, Grbac faded back and found Rison in the end zone for the touchdown. Rison was mobbed by his teammates after making the winning catch. Grbac, Rison and Perriman all were free agents signed by the Chiefs after last season. Jeff George, making his home debut for the Raiders, had third-quarter scoring passes of 37 and 16 yards to tight end Rickey Dudley as Oakland built a 27-13 lead. But George threw two interceptions late in the game, and one of them was returned 55 yards for a touchdown by Darren Anderson. That pulled the Chiefs within 27-22. Oakland prevented the Chiefs' offense from moving effectively after that -- until the final dramatic drive. My brother and I were at this game, as my other brother had just gotten married in San Jose two days earlier. Had to stay over for Monday Night football in Oakland with the Chiefs in town. Up until I just looked this up, I thought it was a walk off. When Rison crossed the goal-line we just looked at each other and said at the same time, "We better get out of here." And true to form, we tried to hit a bathroom, but it was in the process of remodeling by angry Raider fans. We then had to meet up with a friend that drove us (BART was on strike). The guy was sitting somewhere else and had brought his wife. He told us if we wore one stitch of red, he would leave us on the curb. I had no problem complying, and saw several Chiefs fans get something poured on them as they entered the stadium by fans hanging over the walls. Since we couldn't celebrate on the way out, we found a better way. In the offseason, Jeff George was the QB KC wanted, but we settled for Grbac when George signed with Oakland. The pick six George threw set up the big comeback, so we started chanting "f*ck Jeff George!" on the ramps out of the stadium. We got a nice contingent of Raider fans joining us in the chant. So that was fun. Not fun was the bashed out windows on our friends SUV. We had parked on a street, not far from the stadium. Fans just seemed to be pissed, and nothing was stolen. Felt really bad for the guy, as that was a sh*tty way to end the night. But we were on cloud nine. My favorite part of that one is how Chris Conte jumps on Diggs' back as he's going into the end zone, just so can look like he's being helpful.